I’m a big fan of cookies. I mean, BIG fan. 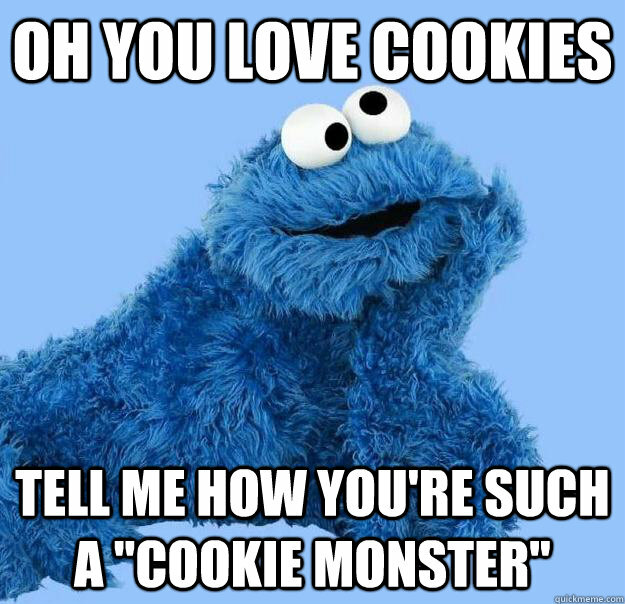 Like I could be cookie monster’s sister, minus the blue fur and sloppy way he gobbles up his cookies. I spare no crumbs!! So in the spirit of the holiday season and because not every night can be Carb Nite, we decided to try a couple new ultra low-carb cookie recipes. With so many Christmas cookie variations out there, there was only one reasonable place to start: holiday spices. We took one of our fan favorites – the Butter Cookies – and simply added in a few traditional holiday spices. My first cookie transformation was a ginger snap. After two attempts I realized that the bottle of ground ginger I was using was old and stale, ugh. I couldn’t figure out why the ginger flavor wasn’t working. Finally after opening a new bottle, we had a winner! This was a great lesson in cleaning out your spice cabinet and getting rid of any stale spices or herbs. It’s a good thing I tried a batch with the new bottle of ginger before I went ahead and recommended several tablespoons! If I hadn’t realized it was stale it would have resulted in some very spicy cookies. Although some people like that sort of thing, I prefer sweeter cookies to spicy ones. The second cookie was pretty simple – Pistachio Cookies. I debated about whether to make it with pecans or pistachios. The green in the pistachios were the clear winner for Christmas time. But if you’re a fan of pecans, I’m sure they’ll be equally as yummy. Just be sure to adjust the carb count if needed. To make it fun and festive we picked up some cute holiday cookie cutters. Why is it always more fun to eat cookies that are shaped like things? But regardless of the shape, these cookies not only taste amazing, but they make the house smell like Christmas. I can’t think of a better reason to make them than that 🙂 The most important suggestion I can make when preparing your dough is to freeze it for the recommended time. I also kept my baking sheet away from the oven so it didn’t get warm. You want the dough to be firm and really cold, which will make handling it much easier. If it starts to get warm it’ll get sticky and nearly impossible to cut with the cookie cutters. The only question left is: Which holiday cookie shapes will you make? In a medium mixing bowl, whisk egg white and softened butter. Add almond flour, vanilla extract, sweetener, salt, ginger, cinnamon, cloves, nutmeg and yacon syrup if using, to bowl; mix well. Freeze dough for 10-15 minutes. It should be firm, not frozen. Place dough on baking sheet. Gently place another sheet of parchment paper on top of dough. Use a rolling pin to flatten out the dough a little. Do not smash too thin. It should be about 1/4 inch in thickness. Remove top piece of parchment paper. Use cookie cutters of choice to create your cookie shapes. Carefully scrape away excess dough from cut outs and use for another cookie. For softer cookies remove from oven promptly. For crispier cookies turn oven off and leave cookies in oven for an additional 10-20 minutes. We've got more desserts in our Transforming Recipes Ultra Low-Carb Desserts Cookbook! Is the last ingredient in the Ginger Snap cookie recipe bacon syrup? I've never heard of yacon syrup!